I have found this species as an escape in a few counties and it has been reported from Monroe County. I found several large trees in Clifty Creek Valley in Jefferson County. Miss Edna Banta writes me that it is a more or less frequent tree on the wooded bluffs of the Ohio River from Brooksburg to Madison in Jefferson County. 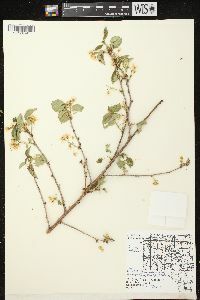 Shrub or tree to 10 m, with widely spreading branches; young twigs glandular-puberulent; lvs broadly ovate to orbicular, 3-7 cm, more than half as wide, abruptly short-acuminate, rounded to subcordate at base, finely serrate, the gland near the sinus; corymbs on short, leafy-bracted branches, 4-10-fld, with a distinct axis; pedicels 1-2 cm; cal and hypanthium glabrous; pet white, glabrous, 5-8 mm; fr dark red to black, bitter, 6 mm thick; stone subglobose; 2n=16. Native of Europe, occasionally escaped from cult. in our range.